Our signature experience! Whether you want the convenience of a driver with your “boat rental,” or you are a novice wakeboarder wanting to step up your game, call Wakepilot. We do much more than take you for a ride in a boat. We combine the best boats available, with instruction from professional coaches to ensure you have a safe, successful experience on the water. Our prices include a coach/driver, top-of-the-line Super Air Nautique, Hyperlite boards, surfers, JetPilot vests, and gas in the tank. Note: rates are NOT per person. They are charter rates that get you and your crew the best wakeboard/surf boat available all to yourself. Note: there are no hidden surcharges. Fuel is included in the price! Reservations within 24 hours of departure time must be made by phone. Wakepilot is pleased to offer the very best wakeboard/surf boat available today and it’s only available to charter right here in Osoyoos. Wakepilot is the only sponsored school in the Okanagan to receive this pinnacle platform. Recognized as the boat that leads the industry in terms of wake and surf wave performance, the G23 stands alone as the number one choice for riders around the world. A world class wake that anyone can surf and pro riders demand is what defines this boat. Over the past five years, the G23 has been awarded the Rider’s Choice Award as the five time Wakeboard and four time Wakesurf Boat of the Year. Quality, innovation and luxury define the G23. The best wakes, the best surf waves and all the high-end refinements you’ve come to know from a Super Air Nautique, that’s the G23. The most popular boat in Nautique’s GS family, the GS22 is the perfect boat that does it all. With hull versatility derived from the iconic Ski Nautique and Super Air Nautique G23, this boat is perfect for any crew that wants to have fun surfing, skiing and wakeboarding. A loaded interior packed with all the latest innovations, the GS22 is ready to bring the good times to everyone who steps aboard. We also have GoPro Camera Rentals available for $40 with any of the above lessons for you to record your Wakepilot experience. Rental is available with any of our usual lesson packages on our boat and includes an SD card for you to take with you. Add a three person biscuit style tube to your charter. 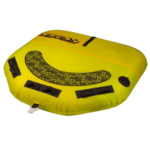 All other gear is included in the charter but tubes incur a surcharge due to their high replacement cost and increased insurance premium for Wakepilot. Worth every penny!